Perched at the highest point of the famously exclusive Southridge community on the edge of Palm Springs’ sprawling Indian Canyons sits the iconic and timeless residence at 2466 Southridge Drive: the former home of iconic TV and comedy legend Bob Hope. For decades, Bob Hope was so well-known that he was given the Guinness World Record for being the “most honored entertainer in history.” Not only was he known for his dancing, singing, and acting gigs, he is also identified with magnificent houses, including the hilltop abode that is now remembered with his name: Bob Hope House. An old post card featuring the Bob Hope house. The home is a masterpiece; using famous architect John Lautner’s California Modernist style combined with the powerful natural shape of a volcano, the building’s vast copper roof slopes upward from three points to meet at a crater-like circular skylight opening over the home’s spacious interior terrace. Wedged between each of the three slopes is a massive rounded concrete shell-like arch hanging over the home’s three entrances and patios, each with enormous glass windows that provide spectacular views of the Coachella Valley, city of Palm Springs, and San Jacinto Mountains. Beginning with a planned hotel and community project commissioned in 1947 by film director Lucien Hubbard (winner of the very first Best Picture Oscar for Wings), architect John Lautner’s designs for the stars came to shape the California landscape throughout the 20th century. In 1973, at the height of his fame, he was commissioned to build the Bob Hope house by Bob and his wife, Dolores, on a 6-acre plot of land. Unfortunately for them, a welder accidentally torched the original wooden frame so they could not move in until the project was finally completed in 1979. The massive 23,366-square-foot home is the largest ever designed by Lautner, who apprenticed under architectural legend Frank Lloyd Wright before becoming a prolific commercial building designer in California as well as a popular residential architect amongst the Hollywood crowd. Beyond the Hubbard-commissioned hotel property now known as the Lautner Compound and the Bob Hope House, Lautner’s other notable work in the Palm Springs area is the Elrod House, a 8,900-square-foot residence constructed in 1969 for interior designer Arthur Elrod. This home is famous for its appearance in the 1971 James Bond film Diamonds Are Forever. Lautner, who passed away in 1994, was posthumously honored for his contributions to Palm Springs architecture with a star on the Palm Springs Walk of Stars in 2017. Although the Bob Hope House was inspired by the shape of a volcano, the building has often instead been compared to a giant mushroom, or, less flatteringly, a downed alien spacecraft. The home has been compared to a country club since it is so large and has so many accommodations and perks. In all, the house and grounds feature a large central terrace (complete with a legendary natural rock boulder jutting into it), six bedrooms, ten full bathrooms and three half bathrooms, a glass-walled dining room, indoor and outdoor pools, as well as an outdoor tennis court and putting greens. Although the building was Lautner’s largest ever, it was not a favorite work of his. Lautner effectively disowned the project after Delores Hope hired another designer to change his interior designs. Her additions are reported to have included a balcony extension to the dining room and internal pathways allowing access from the bedrooms to the front door without walking across the central terrace. She also commissioned murals by Garth Benton for the back wall of the main floor bar and the spa area, where she also placed a large collection of tropical plants. A semi-retired Bob Hope was in the twilight years of his Hollywood career but still avidly touring when the house was built. It was his third home in Palm Springs, and he and Dolores used it mostly as a secondary residence and space for hosting parties and entertaining guests. The interior terrace is capable of accommodating groups of up to 300, and the Hopes certainly made effective use of the space, especially each January when they would throw a grand dinner party to celebrate the close of the Bob Hope Classic golf tournament (now called the CareerBuilder Challenge). These parties featured a large buffet laid out on the central terrace and never failed to included Delores Hope’s famed antipasto salad, which she always made herself. To keep out cold weather while letting party guests enjoy the natural light, a clear tent covering was put up on the central skylight. During Hope’s lifetime, the bedrooms and living rooms of the home were filled with his art collections and personal memorabilia, including his honorary Oscar (holding a golf club), paintings and sculptures by famous artists, as well as photographs with United States presidents, celebrities, and co-stars from his hit films, including Ronald Reagan, Richard Nixon, and Bing Crosby. Bob Hope passed away in 2003 at the age of 100 followed by Dolores eight years later in 2011. 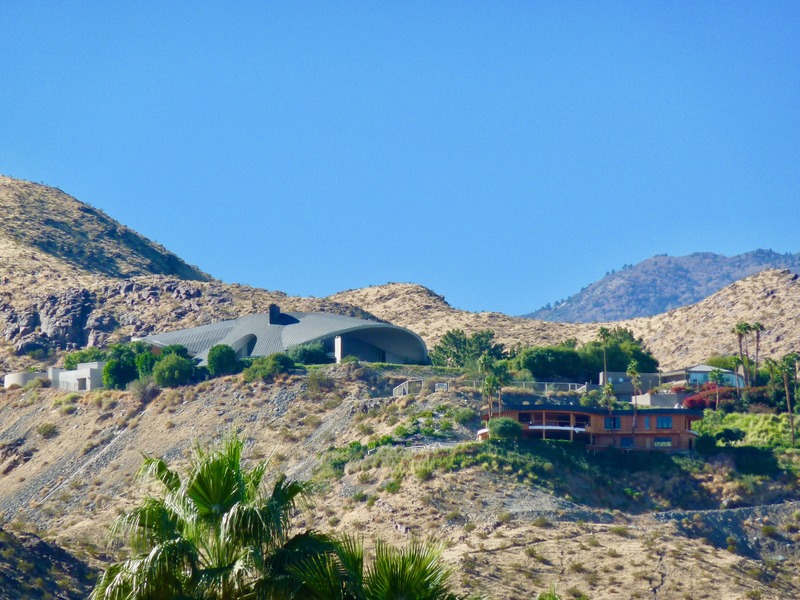 Two years after Dolores’ passing, John Lautner’s Bob Hope House went on sale to the public for the first time ever, priced at $50 million. With no prospective buyers, the asking price was halved to $25 million the following year. In 2015, the building hosted the Louis Vuitton Cruise Collection 2016 fashion show, fusing classic architecture with high fashion for an audience of fashion press, industry leaders, and celebrities from around the world. The home was finally sold to American investor Ronald Burkle in 2016 for $13 million, which remains the highest price ever paid for any residence in Palm Springs. The Bob Hope House is not accessible to the public, but it has been opened for private events. You can clearly see it perched on the hill overlooking the valley, particularly if you're standing outside the Parker Hotel. It remains an enduring symbol of Palm Springs architecture and design. © 2019 Palm Springs Modern Tours. All Rights Reserved.